Can animals win Academy Awards? Then the eight adult horses that portrayed the lead equine in Steven Spielberg's epic story of war should collectively carry home the honors. Of course if you are not enamored by the those large four legged beasts with the soulful faces then the story of his trials during WWI will hopefully impress one with the episodic adventures he encounters. Based on a 1982 children's book by Michael Morpurgo War Horse was adapted to the stage using life sized puppet horses. Spielberg adds his cinematic magic touch that makes his films memorable and become burned into our collective psyche. A thoroughbred colt is born on a farm in the English countryside. The young lively horse is later sold at auction where Ted Narracott (Peter Mullen) overbids for the strong willed stallion in a drunken macho display. His exasperated wife Rose (Emily Watson) is vexed by this move as they need a reliable plow horse. 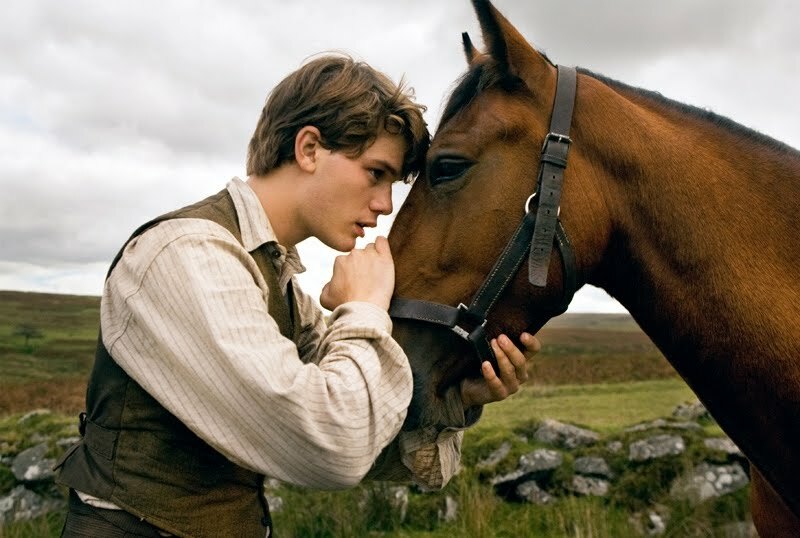 It falls to their son Albert (Jeremy Irvine) to train the horse who he names Joey. He does this with great patience and care and the two of them develop a trust and become BFF's. War breaks out and Ted sells the horse to an officer in order to pay the rent. Back then people still fought calvary style with swords on horseback. It rips the heart out of Albert who is not old enough to join the army swears to Joey that they will be reunited. From this point on characters and situations change in each chapter as the horse endures charging into gunfire, brief moments of serenity, harsh cannon pulling, and barbed wire. Spielberg as in Saving Private Ryan shows the horrors of war and the harsh realities of it's effects on human and now animals. There's a strong attention to realism as patriotic citizens are ready to fight for their country then become confronted by brutal deadly battles that last for years and not the quick fix they had imagined. There's a bountiful cast of familiar actors who show up in small cameos like David Thewlis, Tom Hiddleston, Benedict Cumberbatch, and Eddie Marsan. The most memorable is Niels Arestrup as the French grandfather. Screenwriters Richard Curtis and Lee Hall focus's on the horse and Albert who as the war endures becomes old enough to enlist. It is their will to survive and find each other again that carries the story. Spielberg's direction has already drawn comparison's to a John Ford's work with the awe inspiring visuals, the John Williams soundtrack that carries the viewer through the emotional waves that well up the eyes and and remind us that we are part of something big. All sides of the conflict with England, Germany and France are treated evenly as it breaks it down to a human level as we deal with individuals not generals looking at the bigger picture. These are just humans are just trying to live one more day while they follow orders of their superiors. Just as Joey is unable to leave whatever situation comes up. It's a gorgeous looking film for taking the family during the holidays. Small children may be disturbed by the violence of war and it's toll on it's participants. Spielberg knows how to create a film that swells the hearts and makes the eyes tear up. It hits all the right notes to be the biggest movie of the year. It's obvious and sentimental, it's old fashioned and uplifting as Scarlett O'Hara screaming at the red tinted sky “I will never go hungry again”. It's classic Spielberg making a classic movie throw back.